Yes, it's true! You can now read and study the Bible on your iPhone, iPod Touch, or other compatible Internet-enabled phone (or PC!) using the iPocketBible.com service. Simply login to the iPocketBible.com service using your Laridian customer credentials, and have instant access to your Laridian books and Bibles via your Web browser. Not yet a Laridian customer? Just sign up for a Laridian account to gain access to iPocketBible.com. Your new Laridian account will even include some free books to get you started. 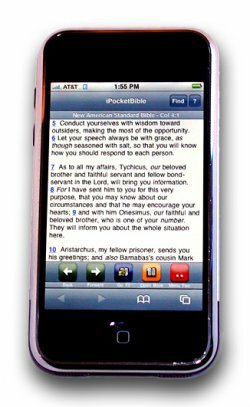 Designed specifically for use with the iPhone and iPod Touch, iPocketBible.com is also compatible with most Windows and Mac Internet browsers. It may even be compatible with the browser included on your Internet-enabled phone! Have you previously purchased books for use with Laridian PocketBible, MyBible or other program? Most are already available for use with iPocketBible.com for no additional cost! Likewise, most books that you purchase for use with iPocketBible.com can also be used with other Laridian PocketBible products for no additional cost! Already a Laridian customer? Login now to access all of your resources. Not yet a Laridian customer? Sign up to use iPocketBible.com and we'll give you some free books to get you started! Forgotten your Laridian login credentials? Click here, submit your email address, and your login credentials will be emailed to you. Questions? See our FAQ for additional details.